I was feeling lazy but still wanted a bite of a special sugar cookie. 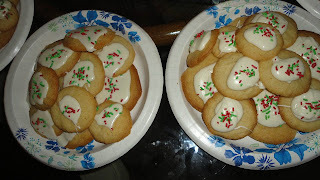 I made simple sugar cookies from a pre-mix. Easy enough, right? Then, I took vanilla icing from a plastic can and stuck the can in the microwave. Now, the icing became wet and melted. I took a soup spoon and dipped drabs of icing onto each cookie. By melting the icing, it makes it really easy to apply and it spreads quickly. Then, the only old sprinkles I had were used to add some color to the top. The icing was so good! 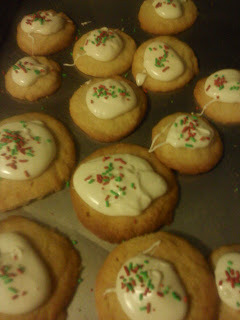 It really made the difference in a boring sugar cookie.